Hosts Green Mountain Derby Dames and the top East Region teams certainly kept things exciting in Burlington, Vermont, Sept. 28–30. The "Sugarbush Showdown" had many nail biting matchups! The top two seeds finished in the same place that they started! Advancing to the 2012 WFTDA Championships are Gotham Girls Roller Derby, of New York, NY; Philly Roller Girls, of Philadelphia, PA; and the Charm City Roller Girls, of Baltimore, MD. Green Mountain Derby Dames has enjoyed the hard work and hospitality of leagues who have hosted tournaments we have attended and we wanted to show our appreciation by returning the favor and introducing the derby community to our beloved and beautiful state. 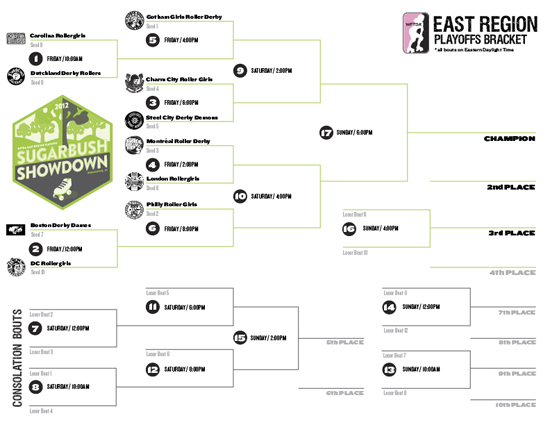 We are doubly excited to be able to host the East Region Playoff Tournament during foliage season! The Sheraton Burlington Hotel & Conference Center is located near the heart of downtown Burlington and is a few minutes from the Church Street entertainment district. Church Street features national and local retailers, as well as many dining opportunities. Find out more about where to book! The Sugarbush Showdown will take place at the Champlain Valley Exposition, a large community events facility that also hosts fairs, flea markets, equestrian competitions, concerts, car rallies and more. The facility features both indoor exhibit halls, where the tournament will take place, as well as outdoor event spaces. A very warm welcome to all of you visiting skaters and supporters! We hope you enjoy your visit to Vermont. Although its rural character is part of its charm, the Green Mountain State can be challenging to navigate. For your convenience, we’ve compiled a list of some transportation options. Gotham Girls Roller Derby (#1), Philly Roller Girls (#2), and Charm City Roller Girls (#3) advance to 2012 Championships!